Bryn Mawr Guest Suites offers 3 cozy, comfortable, fully furnished apartments in the heart of Bryn Mawr. This listing is for Apartment A. 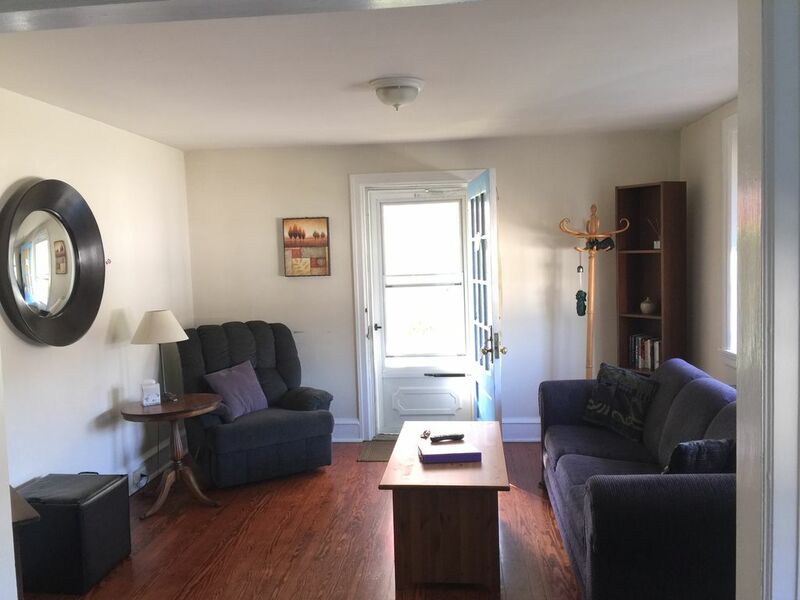 The property is 1 block from Bryn Mawr Train Station, 2 blocks from Bryn Mawr Hospital, and a short drive or walk to several local universities. BMGS is great for multiple family occasions, visiting local colleges (especially for graduations), and for tourists looking to explore the area, but we welcome all guests! We have a 2-night minimum stay. This building is a duplex in heart of Bryn Mawr. Featuring fully furnished, comfortable, cozy apartments with beautiful hardwood floors. This unit is a two bedroom suite with queen size beds and a queen size pullout couch in the living room. A fully equipped kitchen makes for great special occasion dinners in the dining room or on the private balcony - great for watching the sun set! All linens are included. Also included is free off street parking, shared laundry facilities in the duplex's basement, WiFi, and cable TV. This property and the other two units are a great place for multiple families for weddings, reunions, and graduations, as well as tourists coming to explore Bryn Mawr or Philadelphia. Our fenced-in backyard surrounded with gardens is a great place to enjoy an evening cocktail outside or for children to play. Children under 4 stay for free. Long-term and corporate rates are available. Pre-ordered meals or personal chef services are available if requested. Spa services are also available with advanced booking. These are private apartments. Our guests have private entrances, balconies, a free parking lot, and access to a fenced in yard, which makes this especially great for families with young children. Guests also have access to a shared laundry room in the basement with a free-to-use washer and dryer. The owner is always available by cell phone. As a life-long resident of the main line, she can offer great recommendations for dining, shopping, night life, or a picnic in one of the many nearby parks. The owner lives in a separate unit. Bryn Mawr Guest Suites is located in the heart of Bryn Mawr - a unique small town village 10 miles west of Philadelphia. Bryn Mawr is very pedestrian friendly and almost everything you need is an easy walk. The property is one block from the Bryn Mawr Train Station (which has direct access to Philadelphia), many great restaurants, a health foods store, the Best of Main Line Massage and Yoga Center, three gyms, the Bryn Mawr Film Institute, a Starbucks and a local coffee house that features live music, a pharmacy, hair salons, a specialty toy store, the post office, and a local library. Within a two block walk, you can find the Bryn Mawr Hospital, a gourmet grocery store, and several boutique shopping opportunities. Bryn Mawr College is a 5 minute walk. Villanova University is 2.2 miles down the road. Haverford College is 2.3 miles down the road. Rosemont College is 1 mile. Eastern College, Cabrini College, and Saint Joseph's University are all within a short drive. As already stated, we are one block from Bryn Mawr Train Station. The Septa R5 train gives easy access to Center City Philadelphia and the Philadelphia (PHL) airport. You can get to Bryn Mawr by taking Amtrak train service to 30th St. Station and then Septa R5 train to Bryn Mawr. From the PHL airport, take the commuter train to 30th St. Station and then the R5 train to Bryn Mawr. We do provide free pick-ups from the Bryn Mawr Train Station - just let us know ahead of time! Pick up is available from the PHL airport for a nominal fee. Please feel free to drive your own car or rent one and park in our free parking lot. The lot is less than 50 yards from the private apartment entrances. My name is Ann Marie Woods, and I am a passionate world-traveler who knows quite a bit about making Guest Suites comfortable for travelers of all kinds. I have a love for Bryn Mawr and am always happy to recommend my favorite bars, restaurants, and other local attractions to interested visitors. The translation of “Bryn Mawr” from Welsh means large hill. We’re set between Schuylkill and Delaware Valley. It is now a thriving suburb of Philadelphia yet has the feeling of a small village. We are convenient, cozy, and at the center of Bryn Mawr! Perfect for visiting parents of college students. Originally known as Penn’s Woods,the area is located due West of Philadelphia. In the 1800’s, a rail-road know as the Main Line was built for wealthy Philadelphians to travel to their country homes. Built by Welsh and Celtic railroad builders, the station names they introduced are still used today. The proprietor, Ann Marie Woods’, Grandparents left a small Village in Donegal, Ireland looking for a better life in America. They settled in Bryn Mawr in 1920. The building housing the Guest Suites was built the same year and reflects the simple and quaint quality of life of those times. The aim is to carry on the tradition of a cozy and comfortable Irish Guest House. Private chef or pre-ordered meals, and spa services, available if booked ahead of time. The space afforded us in this VRBO was really very surprising. We made use of the fully stocked kitchen and full size dining room table. We will remember this address for our future stays in town. We used the Regional Train Line to quickly get into and out of Philly .... ti was a very convenient location. This was a great cozy rental property. Ann Marie was wonderful to work with. The property is located within walking distance to shops, restaurants, and most importantly, the train. The street is very quiet and out of the way.I would rent this again. We rented 3 apartments for 14 guests from overseas. It was the perfect accommodation for them. Everything was comfortable and clean. Photos do represent what the apartments look like. Location is within walking distance to train, supermarket, restaurants and shopping. The staff was exceptional. They made our guests feel welcome and went above and beyond in enhancing their stay. Our group ranged from 10 yrs to 75 yrs and everyone had a great time. Would definitely recommend BMGS. I have come there 3 times now and enjoyed it every time and so has my family. The staff is very friendly and helpful, the location is perfect (you won't need a car to go to Philly by the near train or do your shopping in Bryn Mawr) and the apartment is really neat and cozy. The rooms are nicely decorated and will make you feel at home. The kitchen is well equipped so you do not have to eat out every day. I would recommend it to anyone, couples and families, that is looking for a good place to stay while in Philly or the Main Line. Bryn Mawr Guest Suites is located in the heart of Bryn Mawr - a unique small town village 10 miles west of Philadelphia. Bryn Mawr is very pedestrian friendly and almost everything you need is an easy walk. The property is one block from the Bryn Mawr Train Station (which has direct access to Philadelphia), many great restaurants, a health foods store, the Best of Main Line Massage and Yoga Center, three gyms, the Bryn Mawr Film Institute, a Starbucks and a local coffee house that features live music, a pharmacy, hair salons, a specialty toy store, the post office, and a local library. Within a two block walk, you can find the Bryn Mawr Hospital, a gourmet grocery store, and several boutique shopping opportunities. Bryn Mawr College is a 5 minute walk. Villanova University is 2.2 miles down the road. Haverford College is 2.3 miles down the road. Rosemont College is 1 mile. Eastern College, Cabrini College, and Saint Joseph's University are all within a short drive. We are one block from Bryn Mawr Train Station. The Septa R5 train gives easy access to Center City Philadelphia and the Philadelphia (PHL) airport. You can get to Bryn Mawr by taking Amtrak train service to 30th St. Station and then Septa R5 train to Bryn Mawr. From the PHL airport, take the commuter train to 30th St. Station and then the R5 train to Bryn Mawr. We do provide free pick-ups from the Bryn Mawr Train Station - just let us know ahead of time! Pick up is available from the PHL airport for a nominal fee. Please feel free to drive your own car or rent one and park in our free parking lot. The lot is less than 50 yards from the private apartment entrances.